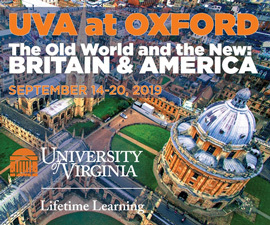 Many things can happen during a student’s time at UVA. Some spring immediately to mind, things like attending classes, getting involved in student organizations or playing a sport. Something else happens frequently on Grounds—falling in love. At last count, there are 12,670 married alumni couples and many others in committed relationships. Here are the stories of just a few of the couples whose relationships began at the University. Jim Gilmore’s first words to his future wife, Roxane Gatling, were that she was sitting in the wrong seat. Jim (Col ’71, Law ’77) had returned to Charlottesville in the fall of 1974 to attend Law School after serving in the U.S. Army in Germany. The University was all-male during his undergrad years; not so upon his return. Jim had been a Jefferson Literary & Debating Society member as an undergrad and was eager to return to its activities. Roxane also had become a member of the society, allowing her to sit in a special, reserved section. The two found an immediate connection in their political interests. Their first date combined door-to-door campaigning for a Republican candidate with attending the Charlottesville GOP Pig Roast. 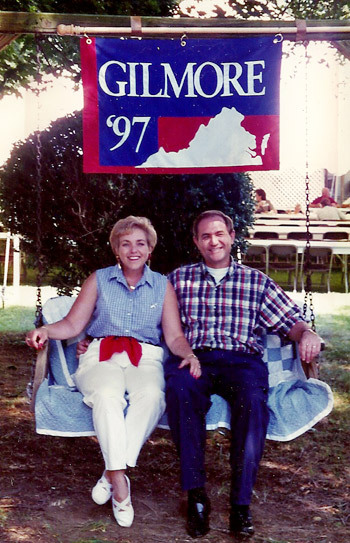 Those interests continued after their marriage in 1977 and led to Jim’s election as governor of Virginia in 1997 and a stint as chairman of the Republican National Committee from 2001 to 2002. The seating kerfuffle was minor compared with a trial later in the Gilmores’ courtship. Roxane was treated for a recurrence of Hodgkin’s disease during her last months at UVA. The Gilmores went on to have two sons who became UVA students—Jay (Col ’05) and Ashton (Col ’10). And, like father like son, Jay met his future wife, Katie McWilliams (Col ’06, Grad ’06), during his time at the University. 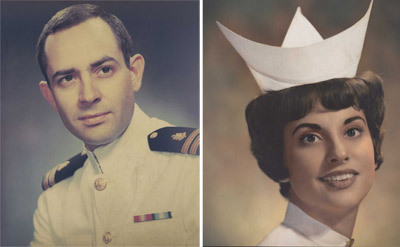 When Dr. Phil Fogle, a medical intern at the UVA hospital in 1966, first saw Diane Giombetti, a nurse, she was en route to deliver a homemade apple pie to someone she was dating. “I made the comment that no one had ever baked a pie for me,” Phil says. One of Diane’s patients noticed the potential for a match. “My patient said, ‘I think he likes you,’” Diane says. Soon after, Diane brought Phil his own apple pie. Phil’s friend, a medical resident, dared Phil to ask Diane on a date, and he finally did. The couple attended the staff Christmas party together, and as they say, the rest was history. “Neither of us dated anyone else after that,” Phil says. Phil’s internship ended, raising questions about the future. The couple decided to get married, knowing Phil would have a two-year commitment with the Navy that would take him to Key West, Fla., soon. “We really thought he was going to go to Vietnam. He was lucky,” says Diane. When Phil returned to his home in Missouri after his service, he rented a car and drove to New York, where the couple got married. They’ve been married for 43 years, during which Phil was an obstetrician-gynecologist in Springfield, Mo., for more than 25 years. 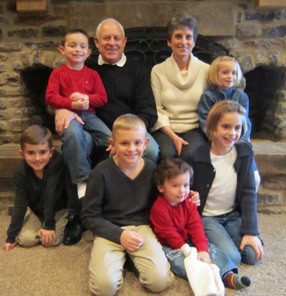 Diane and Phil, who are now both retired, have three children and six grandchildren. 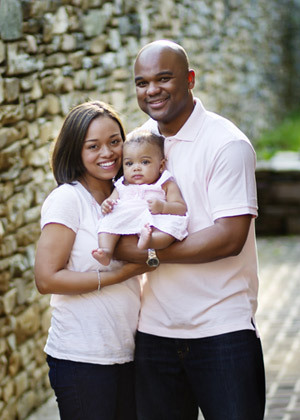 Paul Harris (Educ ’01, ’03) was a graduate student in the Curry School of Education when he first noticed Taylor Sharp (Col ’05), then an undergraduate in the College. They had mutual friends, but it wasn’t until Paul called out to Taylor on a Charlottesville trolley car that they officially met. “I had already seen her before and thought, ‘Wow, she’s beautiful,’ which is why I was able to call her name out and scare her,” Paul jokes. They soon began to date. Paul accompanied Taylor on trips to visit her family in Ohio, deepening their bond. One day, Paul asked his friends to decorate the steps of the Rotunda with flowers and a note for Taylor. When Paul brought Taylor there, he sang Stevie Wonder’s “Ribbon in the Sky” and asked her to marry him. Taylor and Paul tied the knot in 2005, shortly after Taylor graduated from UVA. They welcomed a daughter in December 2010 and are looking forward to moving to Charlottesville, where Paul will be teaching at the Curry School in the fall. Jeff Deavers (Col ’78) and Linn Allee Donaldson (Col ’78) wouldn’t have met if it weren’t for a couple of friends who convinced them to go to their 25-year college reunion in 2003. Jeff postponed a cross-country motorcycling trip by a couple days so that he could attend, and Linn was convinced by a friend that she should give Reunions a try, having never attended one. During a lunch at the Cage during that rainy June weekend in 2003, Linn joined a table where Jeff and his friends were sitting. Jeff left on his bike trip after that weekend, but he kept in touch with Linn while he wandered out west. He emailed her every day. They met up again in Arlington, Va., where Linn has lived for many years, when Jeff returned east. They then began to pursue a long-distance relationship, with Jeff living in Roanoke and Linn in Northern Virginia. 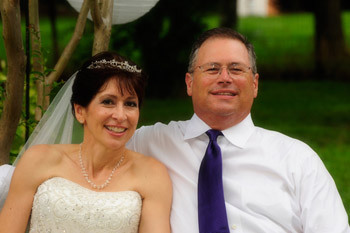 The couple married in 2009 at their weekend home in Louisa, Va., which they chose for its proximity to Charlottesville. The couple now lives together in Arlington. They acknowledge that their time at UVA set them on a path toward one another, even if they lived in adjacent dorms as first-years and never crossed paths. Dixie Shurling (Col ’02, Nurs ’05) and Andrew Mills (Col ’01) share a love of adventure. They got to know each other one night during the spring semester of Dixie’s third year, when she visited mutual friends where Andrew was also hanging out. She planned to go to the library afterward. “He said, ‘Don’t go to the library.’ Those were the first words he ever said to me,” Dixie says. The couple, along with their friends, hopped into their cars and drove to the Outer Banks of North Carolina for an impromptu camping trip. Dixie had offered to drive, and Andrew sat in her passenger seat. They immediately hit it off. A few days later they saw each other again in Charlottesville, when they went out to dinner with friends. The two of them stayed up until the early hours of the morning talking. “And from that day forward, we pretty much spent all of our free time together,” says Dixie. “We were really instantly best friends,” says Andrew. Andrew’s graduation from the University raised the question of whether they would be in the same place. Dixie went to Florence, Italy, for a summer-long study abroad program. Andrew spent 10 romantic days with her there, touring the city on a rented motor scooter and enjoying the vineyards of Tuscany. That September, Andrew set out to tour Central America with a friend. He planned to be away for up to a year and had no definite return date. While Dixie finished her last year of college, Andrew sent her care packages, letters and songs that he composed for her on guitar. “I only ended up lasting about three months because I wanted to get back to Dixie,” Andrew says. The couple married in 2004. They recently returned to Charlottesville after living in both Fort Collins, Colo., and Portland, Ore., while each attended graduate school. 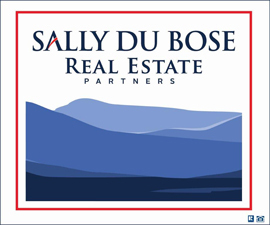 Dixie is a nurse anesthetist at UVA Hospital and Andrew is a certified public accountant.